We recently unveiled a new logo and a new website for the Center for Court Innovation. Created by the Brooklyn-based firm Bardo Industries, our new logo provides us with a fresh look as we enter our third decade. From a design perspective, this was no easy assignment. We asked Bardo to create a logo that was new, bold, and modern. At the same time, we also wanted to hit a note of continuity, emphasizing that the Center is building on a successful track record. Another important design goal was greater flexibility. One of the challenges presented by our old logo was that there was only a single version. By contrast, there are multiple iterations of the new logo -- it can be adapted to suit a variety of contexts and formats. Among other things, this will enable us to have a stronger visual presence on social media. 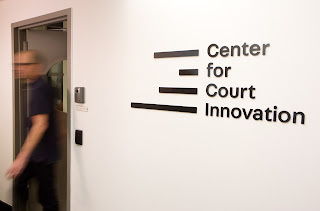 Bardo is no stranger to the Center for Court Innovation. Over the last couple years, they’ve designed posters for the Brownsville Community Justice Center, invitations for the Red Hook Community Justice Center, and postcards for the Center’s 20th anniversary. To develop the new logo, they toured several of our operating programs and held focus groups with a variety of staffers to gain a better understanding of our work and our values. They also spent weeks researching other logos to make sure that our new mark would stand out in a crowd. I'm enormously pleased with the result. For me, the new logo conjures a host of positive associations -- the opening of a book, the slipstream behind a fast-moving object, the bars on a research graphic...One person I showed the logo to said it reminded her of our work to rethink incarceration -- that we are turning the bars of a cell on their side. Bardo is also helping us with the design for our upcoming benefit, which will be held on March 13, 2018 at the Rubin Museum, so stay tuned for more smart graphic design from the Center for Court Innovation.